Note: Also see my Lync Snom Phone Manager Post for more Snom related fun. Are you tired of having to maintain a separate configuration server for your third party Lync compatible SIP phones? Well you’ve come to the right place… At Lync Conf this year Snom officially released a feature (it had actually been available for quite some time) that allows you to push configuration settings directly from a Lync Front End server to Snom Lync UC Edition phones. This saves you the effort of setting and managing a separate server containing configuration files. This is an enormous step forward as it will not only reduce your workload but it will also reduce the number points of failure in your Lync deployment. The way Snom has made the Lync based configuration settings work is by leveraging settings in Lync Client Policy called CsClientPolicyEntries, which was originally introduced in Lync 2010 for sending special configurable settings to Lync clients. An example of this in use is for pushing the photo URL setting back to Lync 2013 clients. If you’re interested in knowing more about how the Powershell settings work behind the scenes, Matt Landis has a post here about it. The short version of this story is that any setting in the phone that you can see in the configuration file can be pushed to a phone using Client Policy settings. All you need to do is take the name of the Snom config setting and pre-append “snom_” to the start of it and then add this setting to a Client Policy Entry within Lync. Create or Delete Client Policies. View all PolicyEntry settings for each Client Policy within a Lync environment. Add, Edit, Delete, and Delete All, CsClientPolicy PolicyEntry settings. Click the "?" button to go directly to the Snom Wiki page for the selected setting or if no setting is selected go to the base Wiki page. Export settings from a policy to file. 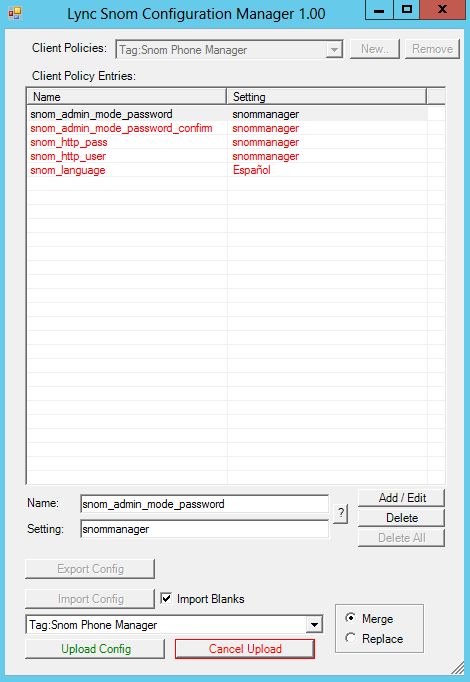 Import settings into the Snom Config Manager tool. This is useful for copying settings between policies, or just saving copies of settings. Note: You can also import Snom configuration files, however, this is not recommended (see the "What about...?" section for more details). Importing configuration files can be done by merging with current policy settings, or replacing any existing policies settings. When you have pressed the “Import Config” button the contents of the file that you select to import will be displayed in the list view. At this stage you are in "Import Mode", meaning that all the settings from the file have not been applied to a policy yet (to let you know you're in "Import Mode" the settings will be displayed in red). This gives you the opportunity to view the settings and Add/Delete settings before you write the settings to a Client Policy setting in Lync (at which time they will become live in the system). Once you have edited the settings as you would like in the Client Policy, you then select the policy that you would like to apply the settings to from the import drop down box and press the “Upload Config” button. Once you have done this, the setting will be written to the policy within Lync. If you select the “Cancel Upload” button the upload will be aborted. The "Merge" radio button will give you the option to retain all the current settings in the Lync policy and add the imported settings to the existing settings (it will also replace any existing settings that have the same setting name as the one being imported). The "Replace" radio button will first remove all settings from the selected Client Policy and then import the new settings in the place of the old settings. If the “Import Blanks” check box is unticked then any blank settings (usually if importing an actual Snom config file) in the config file will be ignored and not imported (Note: you cannot enter blank settings into a Client Policy, so you will need to give these settings values before completing the import process). Note: Be careful with language settings as some use special characters, eg. “Español”. See the settings WIKI here. These are just a handful of examples of settings that you can push to the phones. If you want know more, read the Wiki and try out the settings in the lab until you get your required blend of settings for your deployment. When you are deploying Client Policy settings for Snom phones you must ensure that any policy entry that you add also gets included in all other Client Policies in the system (I call this symmetrical policy deployment). The reason for this is that when a policy entry setting is pushed to a phone, the phone will retain the client policy settings in its memory even when it is moved to another policy, or has had another user sign into it! Lync Policy: "Snom Hot Line Policy"
Policy: "Snom Hot Line Policy"
Note: For settings that have a String type you can use a <SPACE CHARACTER> to set the setting back to blank. This works because the phone appears to trim all white spaces from the setting before applying it to memory. This does not work for Boolean (True/False) type settings, as the phone will set anything that it not explicitly “yes” (including space characters) as being “no”. So be sure that for Boolean settings you explicitly either set “yes” or “no” for the setting (if you need to know the default value for a setting look it up on the Snom Wiki). 1. What are all of these configuration settings? Snom has a wiki that contains a list of all the settings. Clicking on the "?" button will take you to the wiki page for the selected setting. 2. Are settings case sensitive? No. For example, “Deutsch” or “deutsch” can be used. 3. Are settings special character sensitive? Yes. For example Espanol and Español are not the same, the phone will not parse an regular “n” to be a “ñ”. 4. Should I just export the whole config out of a Snom phone and import it into Lync? No. 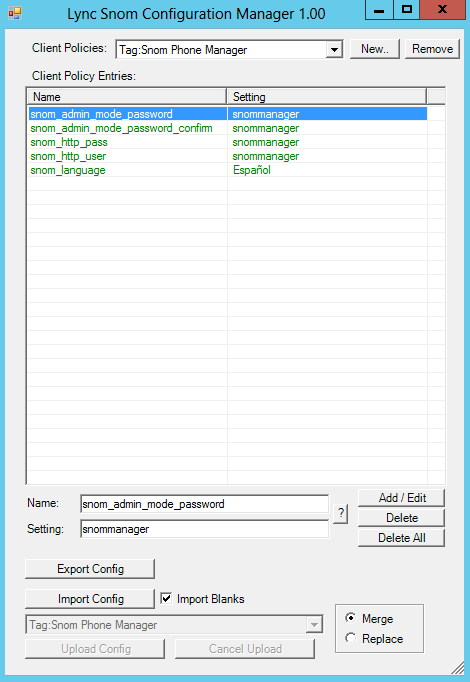 Whilst the Lync Snom Configuration Manager tool will allow you to import a whole configuration file that you have exported from the phone, you should only import the settings that you specifically want to control. There are two main reasons for this: Snom config files are full of blank settings (which cannot be imported and will lead to non-symmetrical settings between policies), and you don't want to import settings that might be used for PIN login. 5. How do you make specific settings in the phone go back to default value? Client Policy Entry settings within Lync can’t be blank (Lync will give you an error if you try to use an empty value for Client Policy Entries). This poses an issue, because Snom phones use blank config settings to indicate that a setting should set to the default value. Settings for values that are strings, like a URL for example, can be removed by replacing them with a <SPACE Character>. When you set a space character in Client Policy, the phone will trim the leading and trailing blank space characters and apply it to the configuration. This will result in a space character being turned into a blank setting. However, if the setting is a Boolean (ie. yes/no) value and you set it to a <SPACE Character>, it will not set the setting to the default value. It instead interprets anything that is not the word “on” as being “not on” (ie. off). Example: If you set snom_show_clock which has a default value of ON to <space character> it will make the setting OFF and the clock will not be displayed. The result of this is that you need to be explicit when making settings using Lync Client Policy Entry settings. If you want a setting to be the default setting, you will need to look at the snom web site, determine what the default setting is, and then explicitly set that in Lync (ie. don’t try and enter blank settings). Note: I have raised this with Snom and they are working on a solution for blank settings, hopefully we’ll see it soon. 6. What happens if you move a user from one policy to another? The expectation here might be that the phone would default all of its values and apply the new policy to a fresh configuration. However, this is not reality… What actually happens is that the phone will retain all of its settings from the previous policy and then apply the new policy settings over the top of the old ones. Example: If you had a phone in a Policy that had a hotline configured in it, and then moved it to a policy that had nothing set for the hotline setting, the phone would continue to function like a hotline phone. In practice this means that all of your policies need to contain settings for every other setting that you have in another policy. So if you have a hotline configured in one policy, you need to have the hotline setting configured to “nothing” (<SPACE Character>) in all other policies. This is kind of annoying… however, something you need to be prepared for! The only other option here is to reset the configuration in the phone before moving it to the new policy. This can be done using the Lync Snom Phone Manager tool (coming soon!) and pressing the “Reset” button. This option is very open to human error though, because you may move a user to a new policy and forget to reset their configuration. I don’t recommend this as a practical deployment option though. 7. How long does it take for a setting to push to the phone? The answer to this is that it’s variable. It appears to depend on where the phone is in its registration cycle. A registration period can be quite long, so it can take many hours for the settings to be pushed to the phone. It is recommended to reboot the phone to know that the settings have applied. 8. Will settings be applied without rebooting the phone?